ChronoScan's Nuance OCR plugin now offers a new optional license that will enable ICR reading for handwriting recognition. After updating your ChronoScan installation and your Nuance plugin to v2.0 (You only need to update Nuance if you are already a ChronoScan user as new users will receive the latest installer at the time of purchase.) 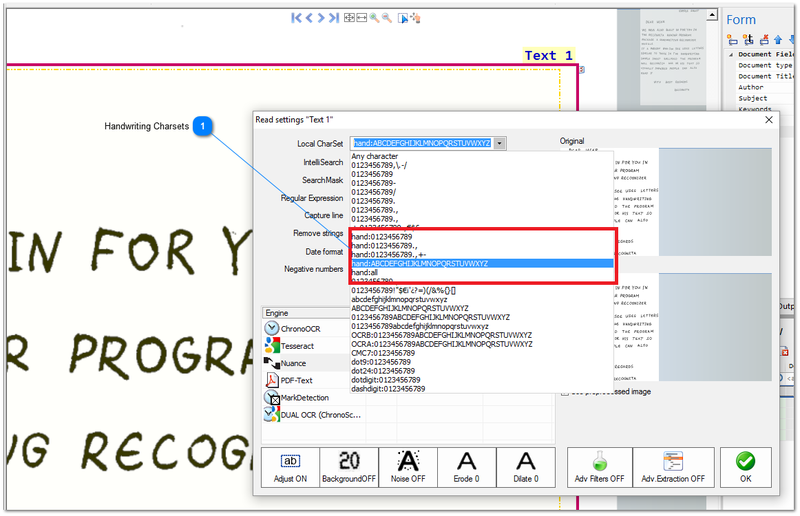 the new ICR options on the OCR Zone capture will enable handwriting recognition. Keep in mind that ICR recognition will only work for OCR Zones and that it's recognition will be limited. Not all hand written text will be fully and correctly recognized by the new engine. What the ChronoScan team suggests is that you request a time limited free DEMO license so you can test the results and assess whether ICR recognition will improve your workflow or not. After installing a ICR enabled Nuance 2.0 license, in order to enable ICR reading you need to create a OCR Zone, enable the Nuance OCR engine and then change the Charset field to any of the "hand:" options. Then you are ready to start capturing handwritten documents. Select the handwriting charset that fits your needs to enable ICR capture.